I am delighted to share with you the good news – I have been awarded an Arts council England Grant for the Arts to enable me to immerse myself for a while in deep research and development of an exciting new project. It’s a bit different to what I usually do – but it draws together my personal passion for objects, art, people and technology. It is early days and I’ll be consulting with people from various sectors over the coming months – watch out for updates and please subscribe to my website if you don’t already – I’ll be letting you know how you can become involved in the near future. For the last year or so I have been developing a framework for a very special project, The Story of Objects. 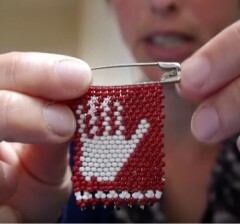 It’s about orphaned objects, curating and an online repository. It’s social and cultural geography, art and genealogy. Do you work in any of these fields? I’m seeking partners to make this happen……. Would you like to have a confidential conversation about joining me on this? If so, get in touch – there is a funding deadline looming…..
CCQ is an arts journal published in Wales. My first article is in this edition, available from all good gallery bookstores. It’s a quality publication and a great read. My piece is a preview of Arnolfini show The Promise and Trust New Art show at Tyntesfield, called PARADISE. b-side runs until 14th September, do go to Portland and see it, it’s the best year ever. Going to the b-side Festival in Portland, Dorset, was a real treat. It was launched by the peal of the bells in the lovely old St. George Church next to Tout Quarry, followed by a soundwork by Duncan Whitley. As the soundwork crescendoes from quiet birdsong to the loud hammering sounds of rock being shaped, the audience became grounded as to why they had come – b-side Festival is all about Portland and the people that live there. A brief stroll down to the local community hall and there was a real sense of gathering. The artists, the curatorial team, local people, volunteers and those who had travelled especially all enjoyed what was on offer. There was Talkaoki (film clip) for those who wished to voice their thoughts loudly on art – which went down very well – and an Arts Confessional for those that had more intimate words to share. As the sun went down, families began to gather outside to have themselves and their bikes dressed with LED lights and soundboxes. As they moved off together as a group, led by Luke Jerram and his team, Lullaby (film clip) floated out into the street and up to children’s bedroom windows. People waved, watched and even cried – a simple idea turns into a moving experience when it is shared. I caught a little movie on my iPhone as they returned, one of those unexpected events that was more magical because it was a surprise. Saturday morning I went on a tour with other b-side supporters to view some of the works. There simply wasn’t time to see them all, so when you go, do make sure you plan things well. We began with Alex Hartley’s work Portland Erratic near Portland Castle. Sited on the harbourside looking out to sea, the work emerged from a sea-mist and seemed to be part of the place already. With it’s window frames painted as white as the fog and the stones it displayed seemingly the material of Portland, it was a surprise to hear that these objects were alien to Portland – had arrived as ballast, or were dumped during industrial works. In the distance, on the headland behind the sculpture, my eye kept travelling to view the dome at the Verne Prison. Another place that will be soon be processing unwanted arrivals on the shores of the UK, when it becomes a holding centre for asylum seekers, following the closure of the prison. 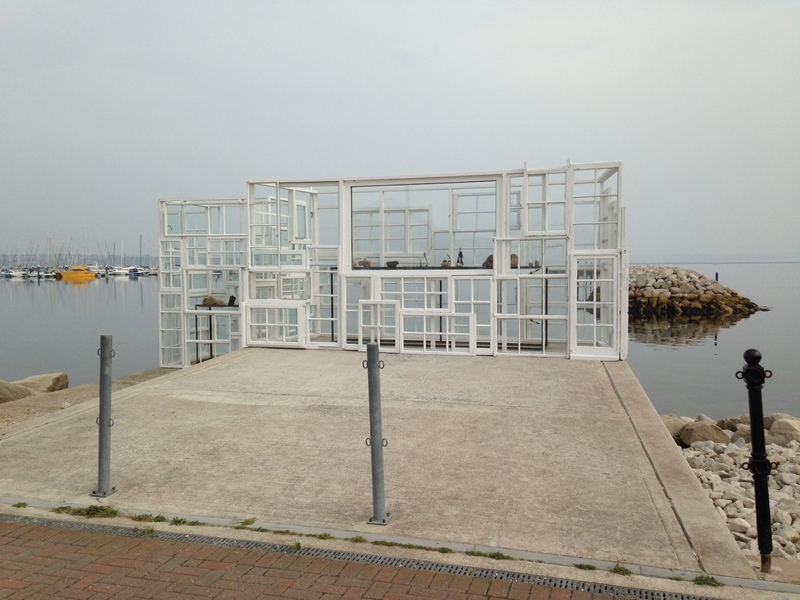 The domestic scale and the use of up-cycled window frames made the experience of viewing the works through the windows, and beyond to the sea, a melancholic experience. A longing for a lost home. A drive up to the Verne followed, where we were welcomed by Simon Ryder and shown his various works, which make up Passage, within the prison walls. Simon weaves stories with objects and histories and creates previously unconsidered links between seemingly disparate behaviours. Struck by a Pathe film he saw online of prisoners wearing masks to conceal their identity while they talked about keeping birds in the prison, Simons mind saw a relationship between the hoods that birds of prey wear and those donned by the men in the film. Another parallel discovery was that the game of squash was invented in prisons and was once a lowly game made by men locked-up and surrounded by high walls. It is now a game played by people with higher social status and is no longer allowed within the prison. The film Simon made, using infrared cameras, re-enacts men inside the prison playing squash, with resounding echoes of the balls as they thrashed against the walls. Confinement and freedom, leisure and echoes of history are all captured by a series of works installed within the rocks of the island. Later the same day I witnessed an underground movie collaged from a historical collection of films that have featured rabbits. One must not mention the word rabbit on the Isle of Portland, because of its implications. Artist Alistair Gentry has been wandering around dressed as one – this snippet of a serious discussion observed by the underground dweller shows him infiltrating the Talkaoke. The films, powered by bicyclists behind the seasons due to the lack of electricity, revealed spoke peculiarities about rabbits in films – especially that they attack people, wear bow ties and are rather fond of white glove and time. Talking was a key feature in two other works. Ellie Harrison shared a beautiful and moving set of personal stories from The Grief Series. Presented in a local home these works allow the viewer/listener to empathise with the storytellers as they responded to a number of questions written on cue cards. They got to choose which questions they would answer and the outcome was very emotional for as visitors sat in a chair opposite a photo of the speakers and listened carefully and privately on headphones. Inside the cinema performance artist Tom Marshman presented a heartwarming set of stories in Everbody’s Auditiorium. Tom enacted charming conversations with local residents that told stories of their lives, with minimal props and subtle lighting and sound Tom warmed the cockles of anyone visiting this seaside cinema. Not to be missed. I also heard and experienced the sound installation, Variable 4, by Jones and Bulley on Portland Bill, lovely resonance and mixing of pre-recorded and responsive sounds, melding in the mist with the deep tone of the fog-horn. Enchanting. There is more, much more, to talk about. But I want you to read this NOW and go and see it SOON. There’s not long and you really do need to go and see for yourself. The support and engagement of the local community s absolutely fantastic – what every socially engaged organisation aims for. B-side Festival is not In Portland – it IS Portland. I attended the Canal & River Trust AGM on Friday in Birmingham’s beautiful new library. The Trust is only two years old, so very early days for them. Whilst their key business is about public engagement they have had a huge number of maintenance works to do as well. It is remarkable what they have achieved in this short time and there was a very positive feeling in the room. I’m very pleased I went because being surrounded by people with a passion for something makes life worthwhile. Laurence Newman, Chair of the Museums & Attractions Partnership said: “Think about the outside of the museums, not just the inside”. This was the first sentence that really took my attention – probably because whilst I work with Museums, I am very drawn by working beyond them too. 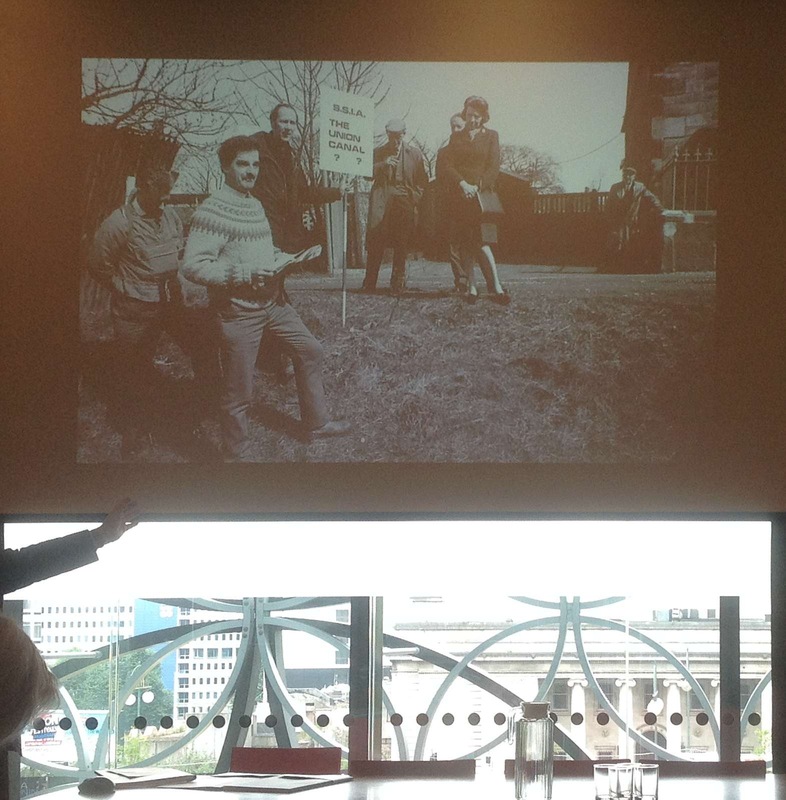 That social history and landscape use is not only archive material but continues to be out there, in the streets, the architecture, in the fields and waterways. The image of the 1960’s protesters floats above the orderly speakers table. Earlier this year there was another protest about the Grand Union Canal in Milton Keynes – which just shows how much people care about access these waterways. The view out to the city of Birmingham beyond is framed by the distinctive circular motifs of the New Library. In the room we discussed the function of the canal and waterway network – past, present and future. Indeed Birmingham is built around the canal system – yet there is no Waterway Museum there. The Gloucester Waterways Museum is much loved, but is being crowded out by the Peel Development at Gloucester Quays. Someone mentioned it should relocate – but without the canal network it would be dislocated and stripped of meaning. Time does not – cannot – stand still. The whole canal system is a museum – but it must also record and document current things, or it will have a huge legacy gap and be frozen in time. I love the way that the waterways are like arteries in the landscape – they carry things and people, connecting places together across time. Art projects could be used to join places up, by commissioning artists to explore each place and share their findings in other places. Occasionally there were terms used that I questioned. There was talk about the Trust being ‘the experts’ and that visitors and the public are ‘customers’. So archiving knowledge is about sharing ‘their’ knowledge. But surely we should be thinking about collaborating with our membership, learning from them just as much as they learn from us? Living the Wikipedia principle both online and off. We are all the public. Defining people as experts and membership as ‘the public’ or ‘customers’ it sets up a mindset of there being a trading transaction, rather than sharing a genuine passion for the rivers and waterways. Whilst the concept of the expert is, of course important, I’m not sure whether it is a useful way to bring people on board to support the Trust. Knowledge exchange, sharing learning and engendering generosity will help to feed the economic machine. I suspect that we are becoming immune to the hard-sell approach. Better to engage with enthusiasts and feed their passion as collaborators, rather than take a service provider role. And that applies to the digitisation of the archives. The archives conserve everyday things that were made by, and belonged to, ordinary people. And living ordinary people can add to the knowledge about those things through storytelling. There was talk about educating and informing people – knowledge belongs to everyone, because everyone has a story to tell. Artists can help in that process. And I hope that I can too. I thrive on these discussions and spend hours of my life considering new ways of thinking about them. the flush of delight when someone I mentor is awarded a grant warms the cockles! I have to share this news, but confidentiality won’t allow me to say who it is – but well done you! It’s an absolute privilege to mentor the people I do – they are committed and serious about their practice and work really hard to survive, despite all odds these days….. I know how it feels to be an artist and face endless applications, constant rejections and still try to keep positive, keep going, believe in what you do. Anyone who thinks artists have it easy has evidently not tried it. I often wonder why I do what I do, but the truth is, it’s because I care. Simple. WHAT’S THE FUTURE OF ARTS AND CULTURE IN THE UK? Now the local elections are over, we have to plan for the general next year. Flow Contemporary Arts, together with many arts and cultural organisations across the UK, are seeking to champion the role of culture in our society. We need your support to make sure our future government understands why the arts are important for everyone. We are keen to engage the public in an informed and open discussion about the place of arts and culture in all our lives, all the more as we move from local onwards and upwards to a general election. We believe the arts and culture enhance every aspect of our lives in ways that are often unexpected and unacknowledged; the vibrancy of our cities, the identity of our rural communities, the future prospects of our children, the quality of our democracy, the sustainability of our environment, the employability of our workforce, the ability to make sense of our experiences and place in the world, and to empathise with others. Ask your local councilor/MP what they are doing for arts and culture in your local area and make it clear to them that you care about the arts. We want reassurance that it will be on their agenda when they deliver their campaign for general election. Follow Flow Contemporary Arts on Twitter, on Facebook and other platforms on advocacy for the arts. Please re-Tweet messages by those who are working hard to support the arts, because we truly believe that art matters to everyone.